AMD has announced a new workstation-class card, the FirePro S9300 X2, which is essentially a compute-focused equivalent of the Radeon Pro Duo. As the 'X2' in the name would suggest, this is a dual-GPU graphics card packing two fully-unlocked Fiji cores on the one board. The specifications for this FirePro card are very similar to the Radeon Pro Duo: 4,096 compute cores per GPU, along with 4 GB of 4,096-bit High Bandwidth Memory per core packing 512 GB/s of bandwidth. The clock speeds of the Pro Duo aren't yet confirmed, but we do know the FirePro S9300 X2 is clocked at up to 850 MHz. Clocked at 850 MHz, the FirePro S9300 X2 packs 13.9 TFLOPs of FP32 performance, which is slightly lower than the 16 TFLOPs the Pro Duo boasts. Unfortunately, FP64 performance is lower than some of AMD's previous FirePro cards at just 0.8 TFLOPs (1/16), although this card is clearly being positioned as an FP32 beast. For those requiring top FP64 speeds, cards like the FirePro S9170 still provide 2.6 TFLOPs of performance. AMD claims this card will be at its best in modelling applications used by industries such as oil and gas, even if it lacks some HPC features like huge amounts of VRAM and ECC memory. The passive cooler, designed for servers, will certainly need decent airflow to dissipate the card's 300W TDP. Like most enterprise graphics cards, the FirePro S9300 X2 packs a hefty price tag: $5,999. 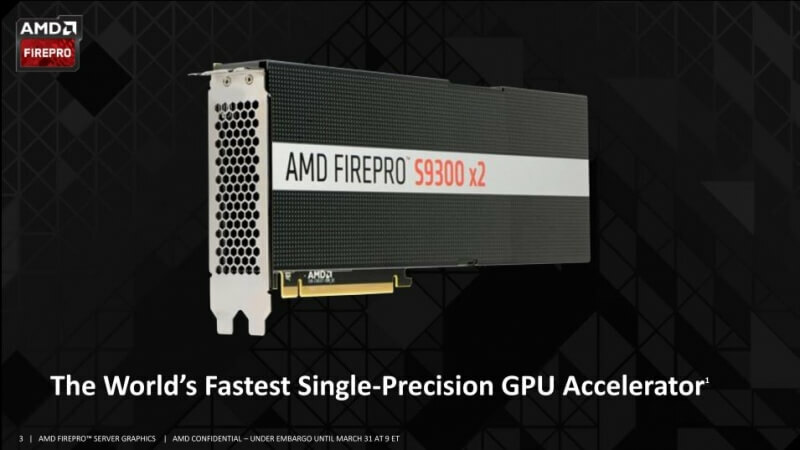 It will be available alongside the FirePro S9170 and other compute cards in AMD's line-up from the second quarter of 2016.